Please join CORE's Abortion Abolitionists as we seek to abolish abortion in our towns, state, and nation! ​We have three priorities. First we want to glorify God. Second we want to see souls saved. Third we want to see babies saved. We firmly believe that priority is correct and each step helps bring about the next. Abortion is America's Holocaust and one that the Church of Jesus Christ needs to be active in standing against! CORE ministers outside abortion clinics, on college campuses, outside High Schools, and various other venues in Oregon and wherever the Lord leads. God bless you and thank you for considering joining the fight! The following is a growing list of Video and Print resources for you to use to the glory of God in this fight to Abolish Abortion! All Videos are listed first. Scroll to bottom of the page to reach the free downloadable print resources. The following Abortion ministries and resources have many excellent facets to them. However, CORE Ministries does not always agree with, endorse, and/or use all materials or ascribe to all of their individual ideologies or methodologies. If you have any specific questions about what CORE does or what type of Abortion related Outreaches we do or advocate doing, please contact us through our contact page or call or text Mason at 541-580-8202. This is a new Abortion Evangelism focused ministry aiming to bring a coalition of Oregon churches together to save souls and babies by the grace of God. 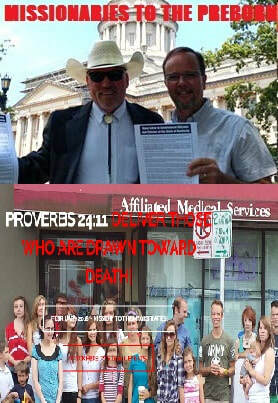 On top of various areas of evangelism there will also be a legislative push to end abortion in our state. Tell your pastor/elders! Want to watch a good movie about the life issue and the Holocaust? click below for this film with over 5,000,000 views! Another film project, this one by Crown Rights Media, is the documentary "Babies Are Murdered Here". Check out info. for this project below. End Abortion Now is an international ministry seeking to help equip the church to fight abortion biblically. This was a one day Live streamed event where pastors, authors, media creators, legal counsel, and other Christians joined together to discuss and plan how we as Americans can bring an end to abortion by the grace of God. You can watch the full recording of this powerful event below. For simplicity I am now also including each individual session so that you can watch it in chunks much easier. Part 2 of 6 of Apologia Ministries "End Abortion Now" event. Pastor Matt Trewhella(Also a leader in "Missonaries to the Preborn") explains Interposition and The Doctrine of the Lesser Magistrate. This speaks much to our need to work in and through our legislative processes to bring an end to this tragedy of abortion legally. ​Part 3 of 6 of Apologia Ministries "End Abortion Now" event. This is a recorded message done for this event with Dr. Herb Titus, the esteemed Constitutional lawyer. Pastor Jeff Durbin interviews him and asks detailed questions about the legality of Roe vs. Wade and more. ​Part 4 of 6 of Apologia Ministries "End Abortion Now" event. Film Maker Marcus Pittman Explains the role of media, social and otherwise that have and will impact this battle to End Abortion Now. He talks about the great video "Babies Are Murdered Here", that he produced. Marcus is the main media producer for Apologia Ministries. Part 5 of 6 of Apologia Ministries "End Abortion Now" event. Joel McDurmon(President of American Vision) deals further with legal issues and how we as Christians should act regardless of what the legislature does. We must only be faithful and trust that God will do His will. He reminds us that, "Small things are big with God and big things are small." Remain faithful! Operation Save America is a powerful organization out trying to save Babies and America as a whole by the grace of God alone, though the furtherance of the gospel in all areas of life. You will be hard pressed to find a more passionate or compassionate advocate for life and opponent to Abortion than Rev. Rusty Thomas. 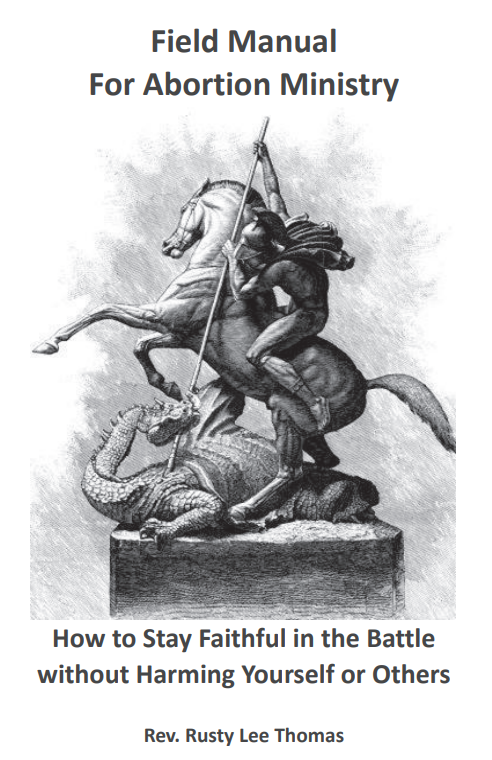 OSA has regional and National events as well as several publications to inform and equip saints to join in the Lord's battles(abortion being only one of them OSA addresses) for His glory and His people's good. Operation Save America from Iron Kite Films on Vimeo. Free the States is new, growing, and currently one of a kind 5 Tenet adhering, Abortion Abolitionism Political Action group! They are awesome and were spearheading Senate Bill 13 in Oklahoma and are helping others across the nation! ​There is an opportunity to join as a member for $25 a month. Get a cool T-shirt and some Bumper stickers and cards to boot! I highly recommend it! 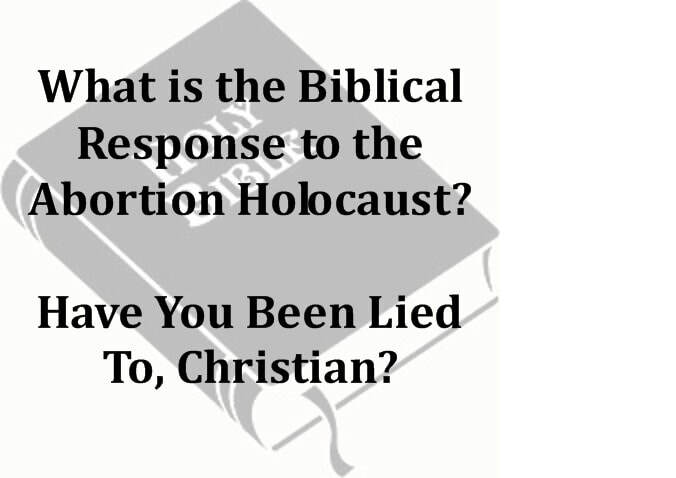 What is the Biblical Response to Abortion? This is a very thorough and very biblical look at the Abortion Holocaust and how we need to respond to it. I can't recommend this booklet highly enough! Rusty Thomas, Director Of Operation Save America wrote this and it is incredible! If you could go to their store and buy some to hand out that would be even more awesome! But feel free to read this digital version and/or print it off yourself. In this Power Point presentation the 5 Tenets and 2 Modes of Abortion Abolitionism are Outlined. There is much detail and many scriptural proofs as well as several image graphics. I created this graphic to show the distinctions between these three views. Only Abolition is Bible, Declaration, and Constitution honoring. 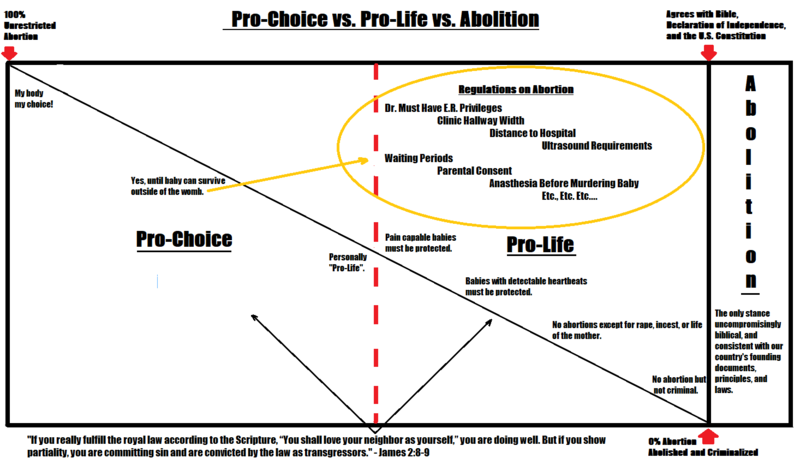 Abolitionism or Pro-Life: You must Choose a Side. 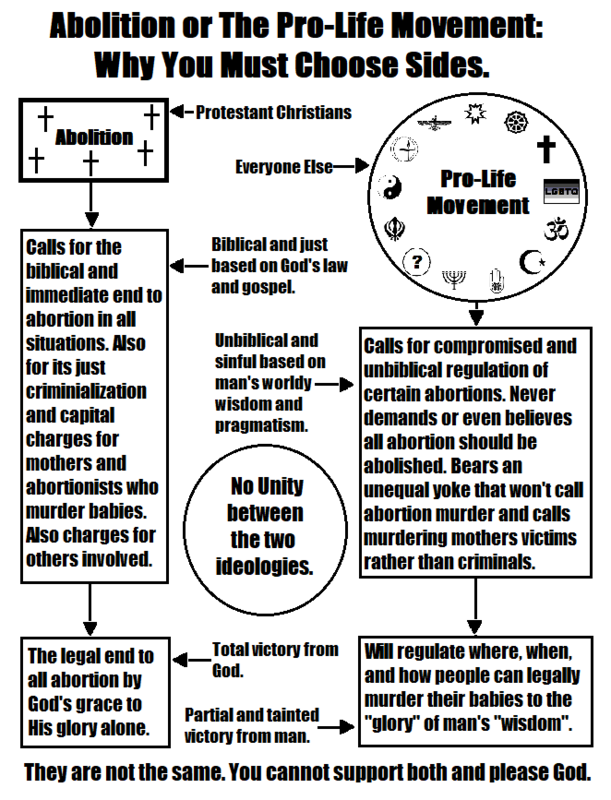 I created this graphic to show that the Pro-Life Movement and the Abolitionism Movement are completely incompatible. Different, foundations, actions, and even end goals. Yes, Christians who identify as Pro-Life can hold the same views as Abolitionists. But why share the name with so many Pro-Lifers who don't? There are no "Abortion Abolitionists with exceptions."